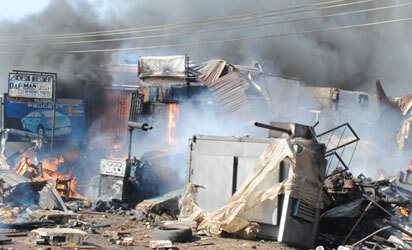 At least 35 people have been killed in Maiduguri, Borno State after two bombs exploded in a a football viewing centre on Saturday, in Ajilari ward, Jere Council area of the state. Witnesses say the explosives which went off at about 6:15 pm, may have been placed prior to the match by suspected Boko Haram members. “We are still counting but so far we have recovered 35 bodies from the scene,” police commissioner Tanko Lawal told reporters. “Our men are still working with rescue workers at the scene and we will update you as soon as possible,” he added. A resident of the area, Al-Hassan Birma, told Anadolu Agency that several people were killed. “Of course several people lay dead with their charred bodies everywhere,” he said, adding that the injured have been rushed to hospital. “People, mostly young people, were watching a football match at around 6pm local time when two bombs suddenly exploded around the viewing center. Birma, who blamed the attack on Islamist group Boko Haram said; “We believe that improvised explosive devices must have been planted near the viewing center by some Boko Haram terrorists to cause much damage”.